The Brooklyn Nets continue with their terrific (all relative, right?) March, beating the Atlanta Hawks 107-92 with a strong performance from both Brook Lopez and Jeremy Lin, who didn’t just do well individually, but worked amazingly off each other with a few deadly pick & rolls. 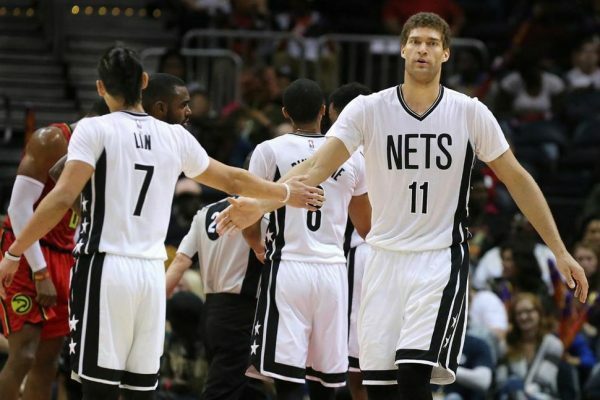 The Nets are 7-8 in March, actually better than the Cleveland Cavaliers. They have two more games this month, and could end up finishing with a .500 record. It won’t get them to 20 wins even (right now at 16 and 57 losses), but it certainly gives us a hint of how much better this season could have been had Lin been playing for most of it, and Kenny Atkinson would have used the Lopez-Lin weapon a lot more. Lin finished with 19 points and 8 assists, getting terrific help from his teammates with some committed, aggressive screens. He didn’t shoot well from outside (1-for-5), but everything else went smoothly. He simply bullied Dennis Schroder with and without the help of big men setting screens for him, easily getting to the paint, to the line (4-for-4) or open enough to find wide open passing lanes. The Hawks are having big issues, losing their 7th in a row and looking like a team that’s lost its way. The Nets pushed all the right buttons and made them look even more miserable. Lopez finished with 23 points, hitting a couple of 3-pointers. Dwight Howard looked confused about when to cover him away from the basket and when to stay near the rim, and Lin made the most of it during his dominant minutes. He played 28 minutes, his most since the win over the Knicks 11 days ago. We’re still waiting to see him play his first 30-minute game since December. It’ll take a non-blowout to make it happen. Besides the Nets usual scorers, Rondae Hollis-Jefferson and K.J. McDaniels each added 11 points while Spencer Dinwiddie finished with 10 points. Isaiah Whitehead finished with 9 points, but his biggest contribution was a terrific block on Schroder, who put up some nice numbers (24 points, 8 assists), but looked miserable on defense. For the Nets, it was once again the bench players who finished with the better +/-, although we did have some garbage time to add some misleading elements to it all. Next up for the Nets are the Philadelphia 76ers, at home. As winnable a game as they get in the NBA for a team like the Nets, who suddenly see an opportunity to finish the season on something of a high and feeling good about themselves. Maybe even surpass last season’s win total? Hard to predict something like that, but in a difficult season like this, that something to cling to when thinking about the few good moments of this season. The Nets have had bigger wins, but personally I thought this win over the Hawks was their most impressive performance, that included 52 second half points and winning 3 of the 4 quarters, playing the kind of basketball they should most of the way.